Can a single player escape from a 'gaming hangover' in the greatest multiplayer game ever made? Do you ever feel exhausted after playing a game ? The credits are rolling and you have been ripped from a fictional universe that you've spent huge amounts of time investing into. It's a feeling I most associate with a JRPG since they last anywhere from 30 hours to sometimes close to 100 hours if you want to see everything. Yes you've thoroughly enjoyed playing the game, but at that precise moment in time the prospect of plunging back into such a big time sink fills you with dread. When you've got a gaming hangover like this, it's good to have on your shelf games that are short, simple and colourful. They aren't games that are going to change the world, your outlook or even tell you a very engaging story. What they will do is entertain, they will excite and they will do this from the very second you press start. Better yet, they do not even need you to think too much. 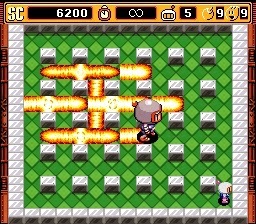 The ‘Bomberman’ series would always come close to the top of a list of accessible video games. The central mechanics are so simple they require no explanation. 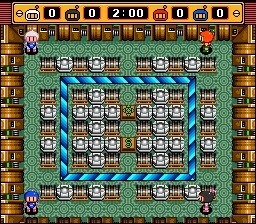 After all, everything you need to know in a ‘Bomberman’ game can be learnt from trial and error in minutes. To steal a description that Super Play magazine once used, “the idea is to drop a bomb and dash around a corner in the hope that it will blow up one of your opponents. Beautiful in its simplicity is it not?” I've mentioned before that some of my happiest memories of video games involve the utter destruction of soft blocks and adorable chaps with pyromania. It's a series that at its core is just about having fun either by yourself or in a room filled with control clutching friends vowing vengeance whenever they fall victim to your devious bomb traps. It is generally regarded as one of the best multiplayer experiences ever conceived, but this wasn’t how the series started. Before there were many multicoloured Bombermen who simply wanted to kill each other, there was just one on his own. He would navigate through scrolling mazes, killing alien enemies and walking through hidden doors to progress to another stage that was pretty much the same. Unlike the earliest games in the series, which had levels scrolling in several directions, the first ‘Bomberman’ game of the Snes, ‘Super Bomberman’, had solo and multiplayer stages limited to a single screen. The settings may have changed, there were sometimes a few quirks and different enemy to distinguish each level, but within the confines of a single screen there wasn’t too much the designers could do. In its sequel ‘Super Bomber Man 2’ this restriction has been lifted. Of course, you are still destroying blocks and looking for power-ups (while trying to trap a defeat the enemies in the process) but there are additions beyond the larger scrolling levels that great improve the game for a single player. Now it takes more than just defeating all the enemies to clear a level. This is supplemented with switches that must be thrown before an escape route is activated. Stages are now set across different tiers, awash with pipes, tubes, magnets and pits. It may seem hypocritical to praise a game for being simplistic, but to appreciate increasingly complicated levels, but the various stage quirks are introduced in such a gradual manner than the additions never feel confusing. The goal of each stage is always the same even if the process needed to achieve this varies. This is a sequel that doesn’t forget what made the first ‘Super Bomberman’so great. All your favourite power ups or here, such the remote detonation bombs, the glove, the boot and of course additional bombs and flames that expand blast length. There’s a drive to collect these of course, since you start off with such puny explosives but by building up your arsenal you quickly become your worst enemy. You’ll find it typically isn’t enemies or the environment that kills you, its walking into your own explosions after you have failed to mentally map how the bombs will chain together. The problem is death late in the game can be almost game breaking, as it resets your power to almost nothing. As a result, some stages become insanely hard, as you feel underpowered and ill-equipped to take them on. 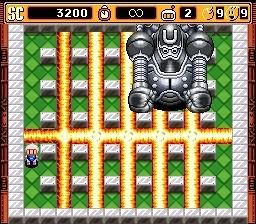 On the flip side though nothing in the game poses much of a challenge to sufficiently powered up Bomberman. The difficulty of the game never feels quite right. It can suddenly go from being far too easy to impossibly hard due to one careless mistake that robs you of all your powers. There needs to be the options to recover some of your upgrades upon death to elegantly solve this problem, something that was introduced to later games in the series. The single player mode of ‘Super Bomber Man 2’ is divided into five worlds made up of six stages. 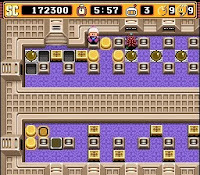 At the end of each the player has to take on one of the five “Dastardly Bombers”. Each has a different kind of bomb with different effects, but the strategy is usually always the same. Either trap them into your explosions or trick them into hitting themselves with their own. After defeat, these bosses then takes you on in a giant battle robot. While they fill the screen and look impressive as with the rest of the game, they remain pretty easy to defeat by a fully powered up hero and very hard for the white bomber if he has only his starting skills. These five “dastardly bombers” actually feed into a story. 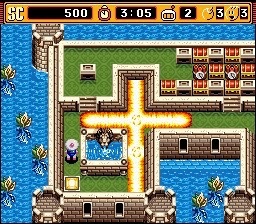 In the first Super Nes ‘Bomberman’ game, the Japanese release had a simple story told through introductory cut scenes. Bizarrely though, these were removed when the game was released in the West and can only be accessed using a cheat cartridge. This time, the storyline in ‘Super Bomberman 2’ managed to survive translation, however its simplistic and only alluded to in an opening cut scene. 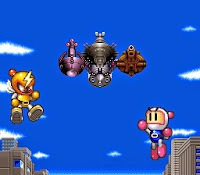 The “Dastardly Bombers” are themed cyborgs that have kidnapped the original White Bomber, in order to restrain him while they destroy his planet. Why they wish to do this isn’t really that clear, but at least you have a vague motivation for blowing them to pieces and can do so with a clear conscience. Of course you have to wonder if a game like this actually needs a story? As Super Play magazine remarked, “the designers have yet to catch on that we need no incentive, reason or justification to blow things up”. There’s isn’t even a resolution at the end of the game, after killing the fifth “dastardly bomber” the credits simply roll making the setup somewhat pointless. You can of course find expansion on the story in the instruction manual, but even that feels like more effort than is needed to enjoy the single player game. 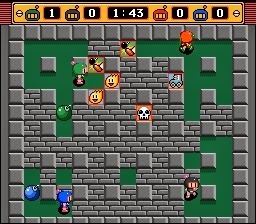 Of course be the main attraction in any ‘Bomberman’ game is and always be its glorious multiplayer mode. Recent games in the series have even done away with the single player mode entirely, so little is the perceived need for it. With friends, ‘Super Bomberman 2’ is perhaps best described as an expansion of the first Snes game, everything here has been seen before and there’s few new ideas. The best addition would be the Golden bomber man mode, which draws attention to the player that one the previous championship. In most cases you are very much aware who is winning already though as they are the one that is gloating the most. Tag team mode is somewhat pointless too as most people team up subconsciously, since there is strength in numbers. But in ‘Super Bomberman 2’ as you can tell who has killed you based on bomb colour, it’s easier to tell if these alliances have been broken. It’s a nice idea, but sadly, various bomb colours confuse things. In the frenzy of explosions it’s hard to tell quickly what’s a bonus item and what’s an opponent’s bomb. There are 10 scenarios to choose from which is actually less than the first Snes game. Each may have their own special twits, but more often than not, like the Technicolor bombs, the level quirks distract from the game rather than improve it. As with ‘Super Bomberman’ there is the aforementioned beauty in simplicity. With this in mind, if you only wish to play with friends there’s no reason to play ‘Super Bomberman 2’ over the prequel. The experience you will end up having will be the same regardless of iteration you pick since after the novelty of new modes has worn off you will always return to the default maze. 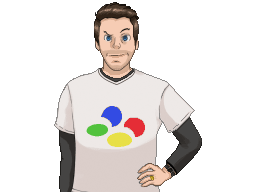 Games journalist Zy Nichols once believed that when it came to developing ‘Super Bomberman 2’, “Hudson Soft has got the wrong end of the stick by concentrating on the normal mode game. This has been improved considerably and some levels are genuinely fun to play [but] this mode was never more than a spin off anyway, and anybody who knows ‘Bomberman’ will think of the four-player battle mode as the real game”. This makes sense but if that was really the case there would be no need for Hudson Soft to have created the sequel, since the first game got the multiplayer mode perfect to start off with. If you are on your own, there is fun to be had with ‘Super Bomberman 2’, which despite the many additions remains a simple accessible game. Yes it is at its best with fiends, but for a lone player it’s not a game you should immediately dismiss. You’d be well advised to pick it over the first Super Nintendo ‘Bomberman’ game as it’s a much richer experience. As James Leach said in his review “there’s a plot, more cutesy animations, and about 50 % more in the single player mode” which when you factor in the significantly larger, more complex levels is probably true. However, even though it is a giant leap from the prequel, the entire single player game in ‘Super Bomberman 2’ only lasts an hour. Truth be told, this is probably the right length for the game though, as it really does bow out before monotony sets in. Were it any longer getting through the levels certainly would feel like a chore. But let’s not forget that its brevity is why it’s such a great “hang over” game; everything can be seen in less time than it would take to level up an RPG character, the ending screen can be got to faster than it takes to watch some cut scenes. Like the first ‘Super Bomberman’ game, this was bought for me as a present by my wife one Christmas. It actually originally belonged to a well known YouTuber who sold off his entire Boxed Complete NTSC Snes collection. I can’t help but wonder how much he misses this game. First of all, the story mode is now 1 PLAYeER ONLY!! and the weapons are pretty much the same. - Punch/toss bombs only work when you STAND ON TOP OF the bomb. Battle mode is still 4 players capable. Several new backgrounds. woo. I think this is an alright sequel though but not a world igniter! No sequrl is ever as good as the original..
Takes until the 3rd to get it right. Needs to be an odd number i think.